Life hasn’t been easy for sixteen-year-old Aaron Soto, but with the help of his girlfriend he’s slowly remembering what happiness might feel like. Thomas is smart and funny, and before long Aaron is spending all his time with him. But as Aaron’s feelings for Thomas intensify, tensions with his other friends start to build. Soon Aaron is faced with a choice – one that will make him question what it is he wants, and how far he’ll go to get it. I saw a lot of good in this book, but I’m not sure if it was quite for me to be completely honest! I haven’t read contemporary for a few months now, which is a long time for me, and although this wasn’t strictly contemporary I still found it difficult to get back into another genre. I’m not quite sure what didn’t click for me, so let’s go through everything. I actually really liked the concept of this book. It was very clever and original but just so sad? I ended up leaving this book feeling hopeful, but still so depressed. And I found the plot so slow to start with! Something massive happened around halfway through Aaron’s story and I couldn’t stop reading after that thing, but I do believe it should have happened earlier. I found this book relatable to very specific people. As Silvera writes in his authors note, many readers who have been through an awful life-changing situations will relate and empathise with Aaron. There was also so much detail surrounding Aaron’s neighbourhood/the people/lifestyle that I felt more and more detached with every new detail. I also had a little problem with Aaron, even though I completely understand why he was the way he was. He just seemed to keep making mistakes, but I guess that’s what makes him human. So as you can probably tell, my opinions of this book are very mixed up and confused. Considering how much I’m enjoying They Both Die at the End, I think I just wish I’d felt more included and enveloped in this one. I really enjoy Silvera’s books, They Both Die at the End is my favorite. 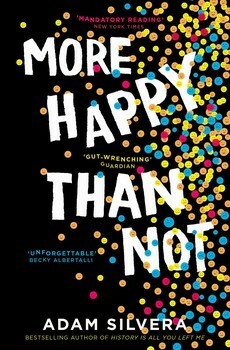 More Happy than Not has a very creative style with the alternating time. I really liked how relatable the characters were so I really felt like I could get into it. Thank you! I read They Both Die at the End just after (review tomorrow) and I found it so different!